Not feeling very friendly today? Display this ceramic tile to tell those around you! It might just save you some trouble! 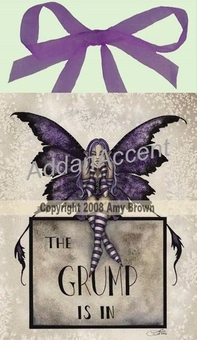 The tile features the art of Amy Brown, with one of her distinctive fairies upon it. The pixie has a scowling expression, and is clad in purple and white, with violet and black wings to match. The fae sits upon a sign that announces, "The Grump Is In". 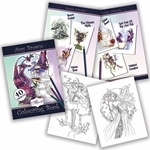 This item features the art work of Amy Brown. It is an 8" X 10" ceramic tile with a full cork backing and two recessed hangers that fold flat for countertop use. A beautiful gossamer ribbon is included for hanging.